This is an adaptation of a recipe in one of my favourite baking books of the year…Sourdough by Sarah Owens. A great book that is packed with inventive and original recipes for using your sourdough starter in other baked goods, not just bread. From cakes to pie crusts to crackers, Sarah shows you how to use your sourdough starter to add flavour and interest to your baking repetoire, an opportunity to have fun and experiment with flavours, making the most of the ingredients you have on hand. Much of the flavour imparted by sourdough is due to lactic fermentation and the presence of acetic acid. Acetic acid also likes to stand guard kicking food spoling microorganisms to the curb before they take a hold and grow their mould. Therefore adding small amounts to any baked good can extent shelf life, good news if you dont always have the hungry hoards around to hoover up the minute they come out the oven. Learn how to do it and expand your baking horizons no end. 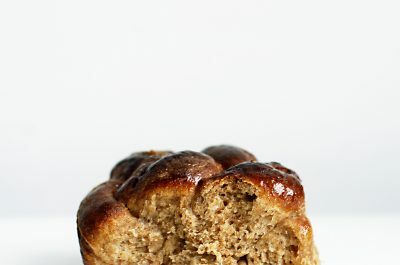 The technique is well worth mastering (if you can call it that…it’s super easy) to add an extra depth of flavour to so many of your baked goods, whether it be cakes, cookies or as in this case muffins. 1. 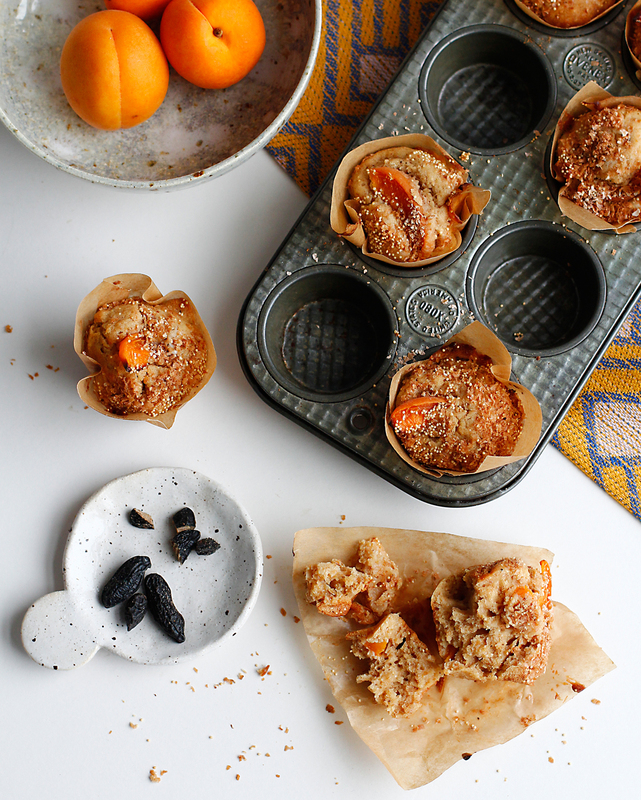 Preheat your oven to 180 degrees celcius and prepare you muffin tin(s) by lining them with paper cases. 2. To brown the butter place it in a saucepan over a medium heat and allow it to melt completely, you will see it separate into butterfat on the top and milk solids underneath. It is these milk solids that we want to caramelise to become toasty brown and nutty. Contiune to heat and you will see the butter begin to bubble and foam, at this point use a whisk to keep the butter moving, you will soon see small dark specks appearing as the milk solids toast, it will smell unmistakeably nutty. As the temperature increases, the water in the butter begins to evaporate, as the butter bubbles it can be difficult to judge the extent to which the milk solids are browning. Keep swiring the pan and if in doubt just take it off the heat for a few seconds, spoon a little out onto a light colour saucer to check. 3. Once the butter is browned to your liking remove from the heat and pour into a bowl to cool. If left in the hot pan you run the risk of burnt black, acrid butter as the residual heat contiues to cook the solids. 4. 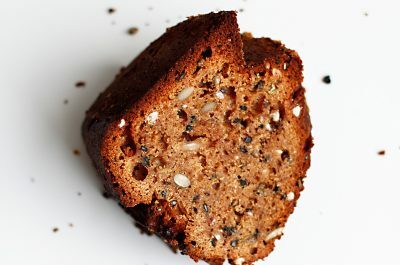 Combine the dry ingredients – both flours, baking powder, salt and ground tonka bean, together in a bowl. Set aside. 5. In a larger bowl mix together the eggs and the panela sugar. This may take a few minutes as the panela softens and dissolves into the eggs, the mixture will thicken slightly as it does when you use regular granulated sugars but it will be a little more syrup like than foamy. 6. Add the honey, the brown butter and the mascarpone, followed by the sourdough starter. Beat until all the ingredients are incorported, but as always be careful not to overmix. 7. 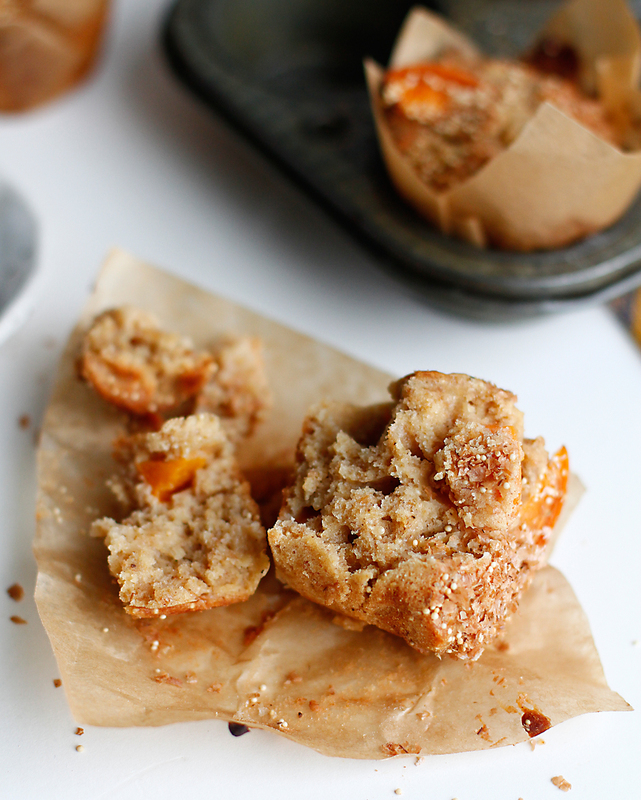 Fold in most of the apricot slices, reserving enough to top each muffin with a slice. Divide the batter up into your muffins cases. 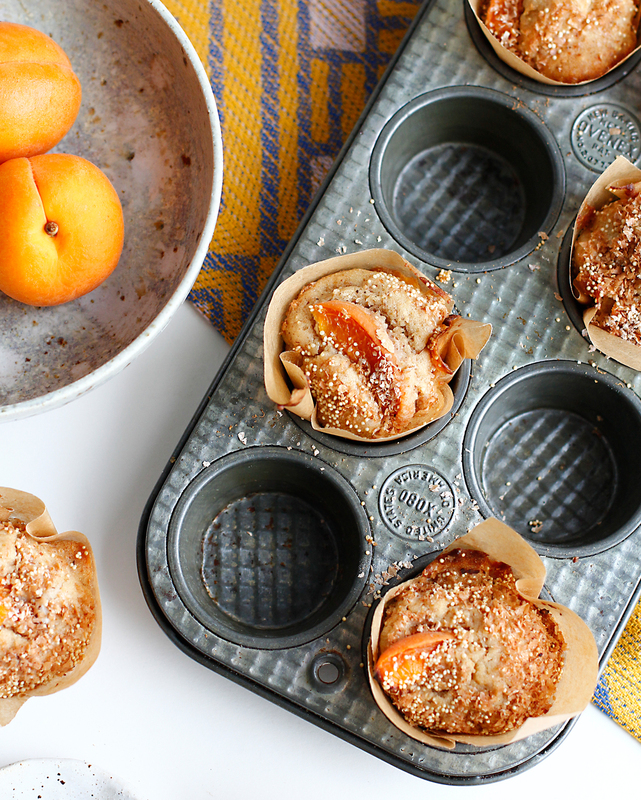 Add the reserved apricot slices and sprinkle with your chosen topping for texture. 8. Place in the oven, regular sized muffins will take approximately 20-22 minutes, mini muffins around 15 minuites. As always know your oven and test with a skewer to be sure they are fully baked.